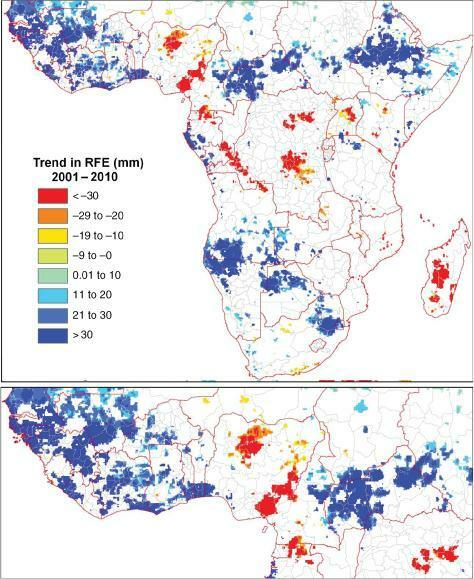 Image credit: Hoscilo, A., Balzter H., Bartholom&eacute;, E., Boschetti, M., Brivio, P.A., Brink, A., Clerici, M. and Pekel, J.-F. (2015): A conceptual model for assessing rainfall and vegetation trends in Sub-Saharan Africa from satellite data. International Journal of Climatology. doi: 10.1002/joc.4231. An international research team led by the University of Leicester has mapped the entire African continent south of the Sahara for geographical changes -- and has discovered that many areas receive drastically different amounts of rainfall today compared to just ten years ago. The study, which investigated the rainfall and greenness of plants in African regions using satellite mapping technology, suggests that areas such as the Congo, Nigeria and Madagascar now receive far less rainfall than they did a decade ago, while other locations such as the Sahel zone have become far greener through increased rainfall. Professor Heiko Balzter, Director of the Centre for Landscape and Climate Research at the University of Leicester and co-author of the study, said: "We looked at the satellite data and discovered a number of surprising hotspots of change. Some parts of the Congo, Nigeria and Madagascar appear to receive much less rainfall now compared to 10 years ago. This is an issue even in the wet tropics of the Congo, where low rainfall means restrictions to ship movements on the rivers there, which are the main transport routes in the dense jungle. "Large parts of the Sahel zone, which suffered from intense famine in the past, has greened up over the past decade, probably because of wetter weather. We know that rainfall in this region depends highly on the African monsoon. The weather systems can change a lot on the time-scales of tens of years. This means that our maps cannot be regarded as maps of long-term climate change impacts. They merely reflect climatic impacts over the past ten years. We know that this period is too short to relate it to the global warming debate. "Future satellite observations will allow us to extend the time-series and observe large-scale changes in Africa." Meteorological stations in Africa are far and between. Satellites can fill in the gaps in weather observations. The researchers used a rain dataset that is produced by the National Oceanic and Atmospheric Administration's (NOAA) Climate Prediction Centre and combined the best qualities of local rain gauge stations with the satellite data. The system is used by the US for a famine early warning system. The findings highlight areas where climatic changes are the likely cause of greener or browner vegetation. More rain can lead to a 'greening up' of large regions, as was the case in the West African Sahel zone. If rains become scarcer, in dry areas the plants cannot 'green up' as much. This effect is large enough to be observed from satellite. With over 30 million km2 in size, Africa is a vast continent with over 200 times the area of England. Many countries are plagued by armed conflicts, water scarcity, diseases such as Ebola and HIV, slow economic development and high dependence on natural resources. Africa's vegetation plays a vital role in securing livelihoods and providing a basis of living for local communities. Dr Agata Hoscilo, the postdoctoral researcher responsible for producing the satellite maps, added: "The results have shown that spatial patterns of different change processes can be detected in specific regions of Africa, which are generally consistent with independently reported literature on longer-term trends, El Nińo effects and decadal-scale climate oscillations. "This study confirms that most of the vegetation in sub-Saharan Africa depends on rainfall variability, particularly in the semi-arid and arid environments; however, there are areas where degradation of vegetation condition is driven by other anthropogenic or natural factors. The concept proved to be less reliable in the wet tropics. Use of coarse resolution satellite data can be a valuable source of information leading to better understanding of the drivers of change." 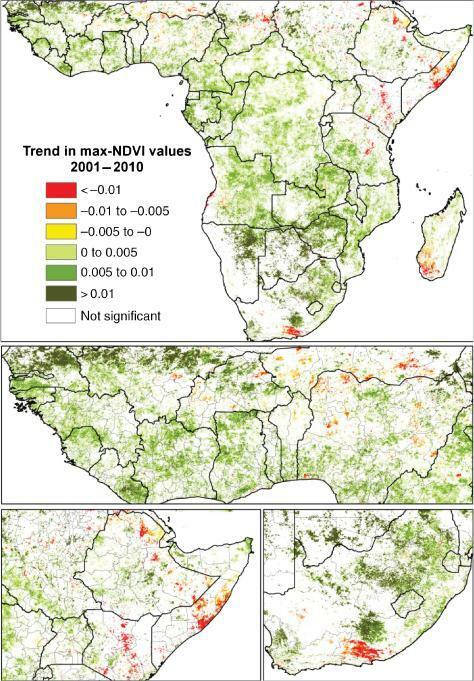 The study 'A conceptual model for assessing rainfall and vegetation trends in sub-Saharan Africa from satellite data' is published in the top-rated International Journal of Climatology, and is already available online. It is open access, free of charge. The journal has an Impact Factor of 3.4 and features in the top 20 journals in Meteorology & Atmospheric Sciences (ISI Journal Citation Reports © Ranking: 2013: 17/76). The research was supported by the EU-FP7 funded Geoland-2 project.